According to General Ronald "Bato" dela Rosa, the Chief Director of the Philippine National Police (PNP), the entire Philippines has been placed under terror alert level 3. This is in response to the foiled attempt by the Maute Group to carry out a bomb attack in Manila last Monday (November 28). The hoisting of the alert level was announced by General Bato during a televised press briefing held in Camp Crame. General Bato also presented during the press briefing the two suspects who allegedly placed the bomb at a trash can near the U.S. Embassy. The two suspects were identified as Rashid Kilala and Jiaher Guinar. According to General Bato, the two men are members of the Ansar Al-Khalifa terror group which includes the Maute Group. One of the men was arrested on November 30 in Bulacan. The other one was arrested on November 29 in Caloocan City. It was also revealed that the men originally targeted Luneta but they ended up dumping the bomb in the premises of the U.S. Embassy. They will be charged with conspiracy to commit terrorism. When asked what the alert level means, General Bato said that it's a warning for the public to be more alert and vigilant in their surroundings. The general added that the police will strengthen its checkpoints as well as intensify its Oplan Sita. Raids can also be conducted by security forces on suspected terrorist personalities and their lairs. General Bato assured the public that the police force and the military are doing everything they can to secure the safety of the country and its citizens. 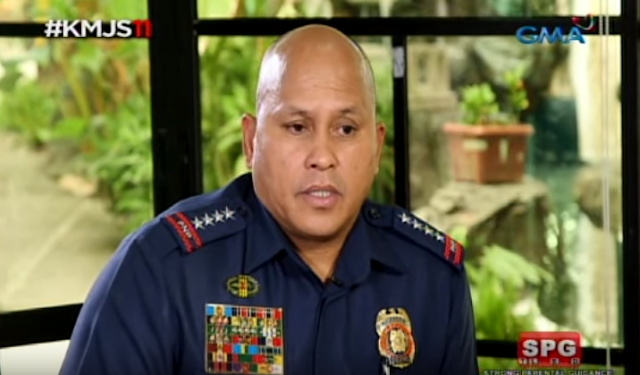 General Bato also revealed that the bombing attempt was the handiwork of five men. Three of the men are still at large. Initial police investigation showed that the men brought in the bomb into Manila from Mindanao. Terror alert level three means that security forces have reasons to believe that terrorists are in the move to carry out an attack. The alert level is raised once the attack is actually carried out.